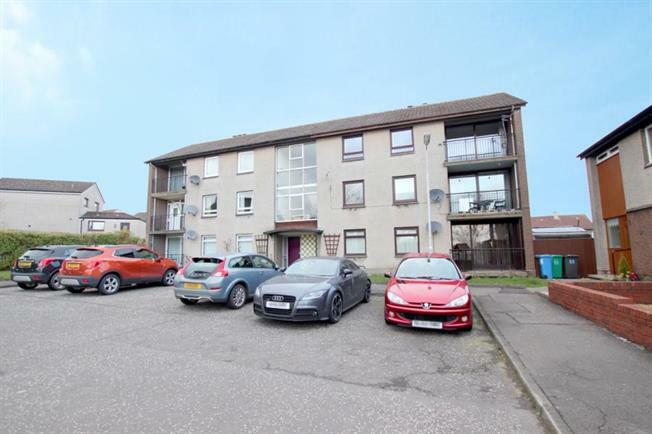 2 Bedroom Upper Floor Flat For Sale in Kelty for Offers Over £69,000. This attractive first floor two bedroom apartment is situated within a popular residential area. The property would suit a variety of purchasers including first time buyers and viewing is highly recommended to fully appreciate the accommodation on offer. Internally the property comprises of welcoming entrance hallway, well proportioned lounge with balcony and space for a dining table, fully fitted kitchen with a range of base and wall mounted units, complementary work surfaces and integrated appliances, master bedroom with integrated wardrobes, tiled three piece bathroom suite with shower over bath, second bedroom again with integrated wardrobes and a box room in which the current owners utilises for storage. The property also has a secure entry system at ground level which gives access into the well maintained apartment block. The property benefits from residential parking, double glazing and gas central heating. The adjoining balcony has space for a table and chairs and externally there is a section of garden ground to the rear as well as a shared drying area. Access is gained into an entrance hallway which benefits from two storage cupboards. The village of Kelty is located off the M90 motorway which provides commuter access to the North and South. Within the village a range of local shopping, civic and recreational amenities can be located. Schooling is available at primary level at Kelty Primary School and St Joseph's RC Primary School located off Cocklaw Street. The area proves popular with commuters seeking access via surrounding road and motorway networks centers of business throughout East Central Scotland, Fife and Tayside.